...... This allows for the transfer of information from one form to another, with the click of the mouse. You can view tips, user information boxes, instruction pages for the form and help functions that are integrate into the form. Input information to scanned forms and print the formation on pre-printer form. When you load a form and store the information you add the information to the form database. The created databases are searchable and allow for a wide range of search functions. The pdc web site contains a large assortment of forms to download. 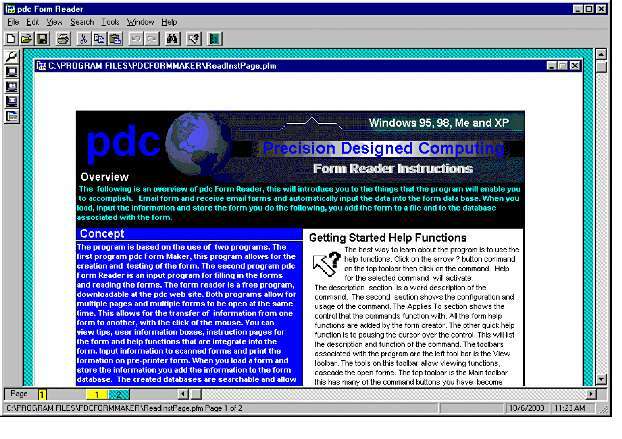 A large amount of the forms on the pdc web site are generic forms. The term genetic means that the designed allows the form to be used with both programs and things like the company name and other common information are changeable.? Qweas is providing links to pdc Form Reader 1.0.0 as a courtesy, and makes no representations regarding pdc Form Reader or any other applications or any information related thereto. Any questions, complaints or claims regarding this application pdc Form Reader 1.0.0 must be directed to the appropriate software vendor. You may click the publisher link of pdc Form Reader on the top of this page to get more details about the vendor.